Open from the Easter weekend through to autumn 2018, Pitch Stratford is back after a successful summer. 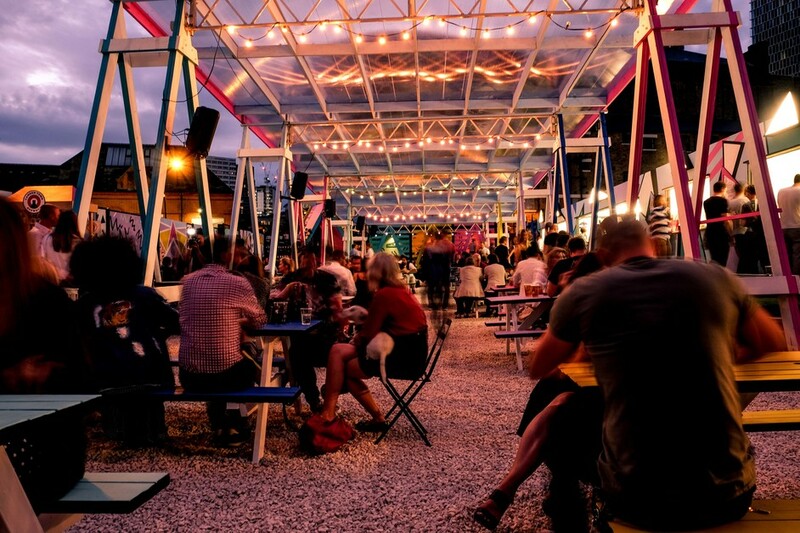 An open air space in the heart of Stratford, it offers street food, screenings and drinks in a colourful outdoor space just a short walk from Stratford station - a perfect escape from Westfield Stratford City. Tico's supply the hot dogs and ribs, The Gyoza Guys deliver the dumplings, there's modern Greek food by Kalimera as well as homemade churros and crepes. Easing you into the weekend, Thursdays brings fun activities to try. Fridays combine daytime networking with after-work drinks deals and Saturdays come in three parts: family-friendly street food lunches; lazy afternoon or early evenings of alfresco eating and drinking; before a themed party night or outdoor film screening. Sundays are for brunching, with flowing prosecco and DJs bringing a laidback Ibiza vibe to E15. World Cup matches are shown on the big screen in spring which becomes an outdoor cinema in summer. Don't fret if it rains, the pitched roof will keep you dry. Pitch Stratford gyms, sporting activities, health & beauty and fitness. The best pubs near London Pitch Stratford. Pitch Stratford clubs, bars, cabaret nights, casinos and interesting nightlife. Where to have your meeting, conference, exhibition, private dining or training course near Pitch Stratford. From cheap budget hotels to luxury 5 star hotels see our discounts for Pitch Stratford hotels, including Holiday Inn Express London-Stratford from 90% off.